Our friends at the hypergeeky, futuristic Detroit Underground have built an app. And it’s full of videos, layered in a VHS-style retro video interface. 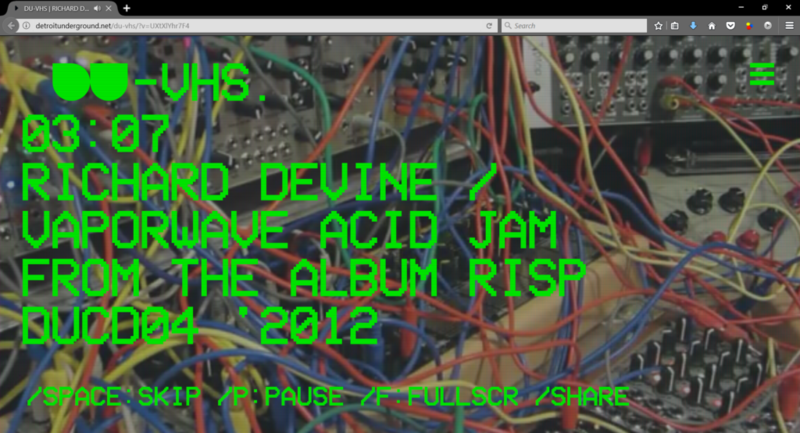 DU-VHS is available now for iOS (iPad and iPhone both), and as a Web app accessible through any browser, all for free. Step inside, and you’re treated to an explosion of electronic sound and image – burbling, bleeping hyperactive musical textures, and degraded retro-videocorder lo-fi renditions of videos. There are music videos, loads of live performances, and even interviews and synthesizer odds and ends. It’s the work of designer Jean Christophe Naour. If you’re wondering why all of this is festooned with enormous VHS camcorder text from the 80s and glitched out to look like it was overdubbed from your 1980s video collection, that’s because DU are planning a VHS release series. Yes, because compact cassettes have gotten way too mainstream (sellouts! 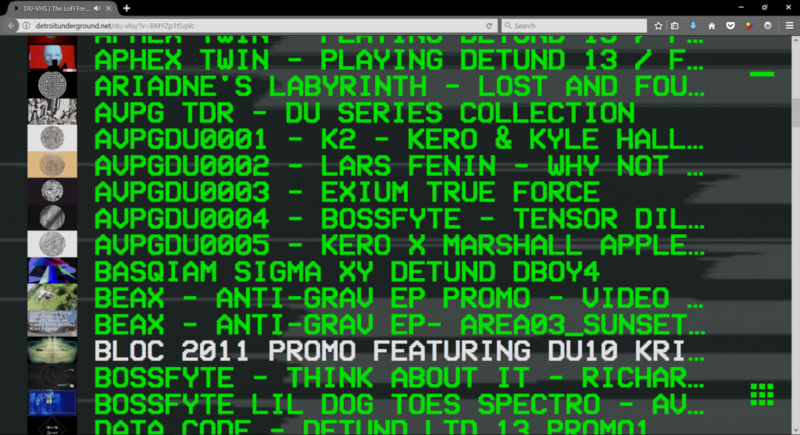 ), DU will do some album releases on VHS tape from your favorite artists. The interface is a little confusing, true to form, so let me explain. The iOS version I find a bit frustrating, actually, in that tapping anywhere advances to the next video. But other than that, you’ve actually got two fairly straightforward modes. If you want to queue up something specific – like from your favorite artist – click/tap the hamburger menu at the top right-hand corner. Then scroll down past the acknowledgements/credits, and you’ll see the videos. You can then swap between thumbnail and list views. This mode is best if you’re lying in bed and want to treat yourself to some DU video action on your iPad/iPhone – you know, for bedtime / as an aphrodisiac / whatever. Or, you can just leave the whole thing running and it’ll randomly load stuff up, which makes for a nice Detroit Underground radio station playing away in a spare browser tab. But there’s loads of stuff in there – Adam Jay, Alexandra Atnif, Annie Hall, Kero, Kyle Hall, Housemeister, Jay Haze, Jimmy Edgar, Modeselektor, Noncompliant (aka DJ Shiva), Oscar Mulero, Phoenecia, Richard Devine, and tehn (of monome fame) are just a few reminders of just how many wonderful artists have been on this label over the years, from beautiful gems from obscure artists to obscure gems from famous artists. Add to that the more recent DU series of fine Eurorack gear, and you have basically a nerd singularity. Naturally, this app will continue to fill with news and videos as DU keeps on goin’. So even a few minutes on the Web app should convince you to check out the label if you haven’t already listened to me prattle on about them.